If you carry your Nintendo 3DS family system with you wherever you go, your system will automatically use StreetPass whenever you pass by another player. When this happens, your Mii characters will transfer to each other's systems, carrying your gameplay profiles. Go to places where many people gather and who knows whose Mii you might meet? 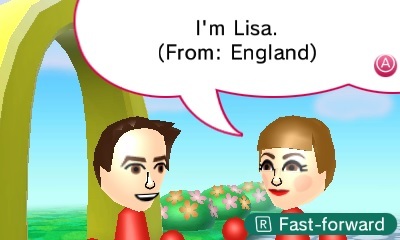 In StreetPass Mii Plaza you will meet the Mii characters of other players, complete with some of their profile data – like the country they're from and the game they played most recently. You might even meet the Mii of someone with the same gaming interests. Just make sure you always carry your Nintendo 3DS family system with you wherever you go and soon your plaza will be a fun-filled place for Mii characters to gather! Maybe you can even find people who like the same game as you in your area! Additional StreetPass Mii Plaza games are available to purchase! To purchase additional StreetPass Mii Plaza games, a system update may be required. For more information on system updates, please visit our Support section. StreetPass can be switched on/off. You can add people who have created offensive Mii characters to the blocked-user list. Please refer to your system's Operations Manual for details.